Exploring the early catalog of the French independent label Accord. 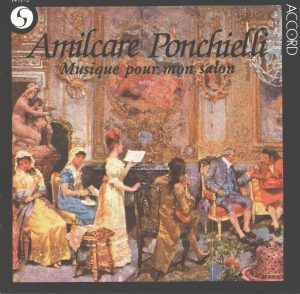 Of course, Amilcare Ponchielli is known primarily, and perhaps exclusively, as a composer of operas, and even, if you are not a great fan of the genre, of one opera, La Gioconda, So it is interesting to hear some of his instrumental and chamber music. 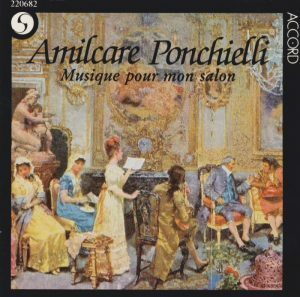 I haven’t been able to come by a complete catalog of Ponchielli’s works online, but it seems to have been a very minor aspect of his output. It is indeed “music for my salon”, salon-music, light-fare, aiming for charm and playfulness rather than pathos, more Rossini than Verdi. 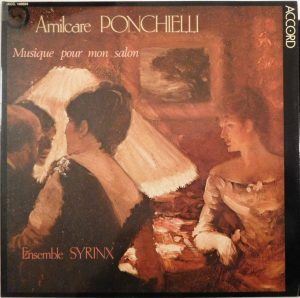 What’s very typical of Ponchielli’s instrumental music is that it is very operatic, although it would be operatic comedy, commedia. 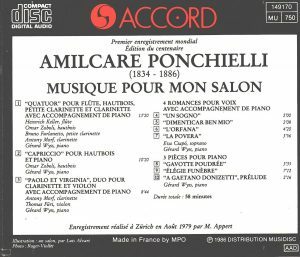 It is significant that Ponchielli should call his Quintet for piano and winds a “Quartet” for winds with piano accompaniment, and likewise with “Paolo et Virginia”, a “Duo” for clarinet and violin with piano accompaniment. In the Quartet for winds, the piano with plays the role of an orchestra in miniature, integral with an “orchestral” introduction, underpinning the cajoleries of woodwinds. Even the pieces for solo piano, at least Elégie funèbre and the Prelude for Gaetano Donizetti, sound like piano reductions of orchestral pieces, or rather, here, like piano drafts of pieces conceived for orchestra. But there is, in the Quartet for winds, a rhythmic bounce, a playfulness, a skittishness that sets it above the merely run-of-the-mill. There is, in the Capriccio, alternating with the playful and fluffy charm, more pathos, but it is the mellifluous pathos of a Bellini or Donizetti aria. But in Paolo et Virginia”, together with the same mood of light playfulness, there are moments of intense and beautiful lyricism. And, not surprisingly, the most operatic are the Four Romances for soprano and piano, opera arias in miniature, and you don’t need to follow the lyrics (texts not provided) to get that they are all about the pangs of love. They are also beautifully sung by Eva Csapo. 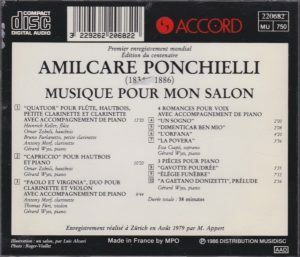 The CD was first issued by Accord in the late 1986, with no barcode, and later reissued, with same cover art except for another label number, and now with barcode (but I don’t know exactly when, probably circa 1988, when barcodes became more common). I have the later edition, the cover images for the first edition come from the entry on Amazon and are cropped in a way that cuts part of the edges. That edition is listed on the Amazons under barcode 723722491320, which appears to be a distributor’s barcode. 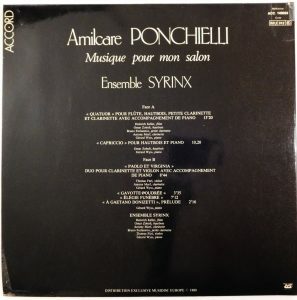 The recording was originally issued on LP Accord 140024 (but without the Three Romances), and the performers were then called “Ensemble Syrinx”. Not any more on the CD reissue. TT 58 minutes, scanty liner notes, some brief traces of pre-echo in track 3. Light fare, but entertaining.